Barack Obama has sunk to a new low. He is using the threat of a UN Security Council resolution that would divide the land of Israel and give full UN recognition to a Palestinian state to blackmail Israeli Prime Minister Benjamin Netanyahu. Many had expected France to submit this resolution to the Security Council for a vote in September, but the French made it very clear that they were not going to go ahead unless they had U.S. approval. So that means that all of the power is in Obama’s hands, and apparently he is not shy about using it as leverage in order to get what he wants. And apparently one thing that Obama wants is for the Israeli government to keep any new settlement construction from happening in “Palestinian areas” of east Jerusalem, Judea and Samaria. The administration of US President Barack Obama has denied reports in Israeli media Tuesday, according to which Obama threatened Prime Minister Binyamin Netanyahu against lifting the unprecedented building freeze in eastern Jerusalem, Judea and Samaria. 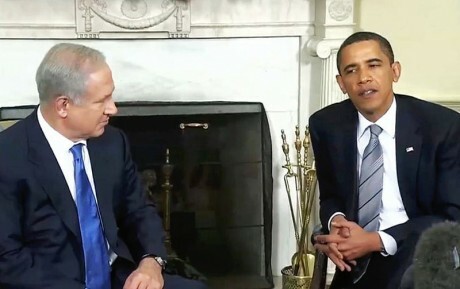 Channel 2 reported on Tuesday night that Netanyahu folded to pressure from Obama, who threatened that if Israel approved new construction following the wave of Arab terror attacks, the US would not veto a looming UN Security Council resolution that would establish “Palestine” and declare “settlements” in Judea-Samaria illegal. This potential UN Security Council resolution is still very much alive. At the end of September I wrote an article that quoted a Jerusalem Post piece about it, and just yesterday I quoted a Politico article that discussed how Obama has been weighing his options regarding this resolution. Ultimately, I believe that Obama will throw his support behind this resolution and it will be submitted to the UN Security Council for a vote, but for the moment he seems to be using the threat of it to push Netanyahu around. Of course the Obama administration is publicly denying all of this. U.S. State Department spokesperson Mark Toner told reporters that everything that Channel 2 was reporting was untrue, and that there is no reason to be concerned. But this is what Obama and his minions do. They lie and then they tell more lies to cover up their previous lies. What is true really doesn’t matter to them. The only thing that matters is what is politically expedient. Despite Toner’s claims, Judea and Samaria regional heads who met with Netanyahu on Tuesday night say he refused their demands to renew building, directly referencing international pressure. The report of Obama’s threat comes just a week after a report in Politico that revealed Obama twice refused to veto a UN resolution establishing a Palestinian state. According to the report, Democratic Senate Minority Leader Harry Reid asked White House chief of staff Denis McDonough twice this year to have Obama publicly announce he would veto a UN Security Council call establishing “Palestine.” On both occasions, Obama flatly ignored the request. Obama does and says all sorts of things behind closed doors that he would never admit to publicly. That is why we can never trust any of these “public denials”. In so many instances we find out that things that the Obama administration “denied” later turned out to be true. Nine of the ten costliest insurance events in U.S. history, six of the seven costliest hurricanes in U.S. history, three of the four largest tornado outbreaks in U.S. history, nine of the top ten natural disasters in U.S. history ranked by FEMA relief costs, and the two largest terrorism events in U.S. history all transpired on the same day or within 24-hours of U.S. presidents applying pressure on Israel to trade her land for promises of peace and security, sponsoring major land for peace meetings, or making major public statements calling for a Palestinian state. For example, October 1991, President George H. Bush promoted and proudly signed the infamous Oslo Accord at the Madrid Peace Conference. The Oslo Accord was labeled a land for peace accord that demanded Israel award their land to the Palestinian terrorists in exchange for peace. This perverse proposition was if you give us your land and we’ll stop killing you. The next day the Perfect Storm hit Kennebunkport, Maine. Waves over 30 feet demolished the home of President George H. Bush, the instigator of the Oslo Accord. This very rare storm started in the north Atlantic, moving east to west, the wrong direction for storms to move. I don’t know exactly when Barack Obama threatened Netanyahu, but it is quite interesting to note that Hurricane Joaquin has been creating tremendous havoc along the east coast of the United States in recent days. Officials in South Carolina described it as “a 1,000-year storm“, and major flooding caused billions of dollars in damage. Could it be possible that there is some connection? Of course what will be much worse is when Obama finally tires of toying with Netanyahu and decides to move forward with this resolution at the UN Security Council. By playing a pivotal role in the dividing of the land of Israel, Obama will be cursing this nation. Let us hope and pray that day is put off for as long as possible. I know that this must sound very strange to many of my readers. If you are skeptical, just take note of the date when this UN Security Council resolution finally gets approved and watch what happens to this country afterwards. I think that you will be absolutely shocked by what takes place.